It’s a challenging task to choose the right e-commerce platform for your store. 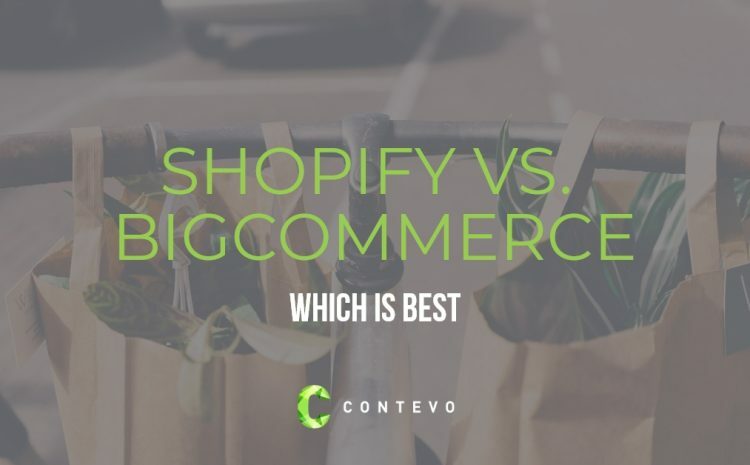 The two leading e-commerce solutions, Shopify and BigCommerce, might confuse you because there isn’t any clear-cut winner when it comes to features, pros, and cons. You need to make your choice based on your objectives, where you see your e-commerce store in next few years, your marketing strategy, customization, and more. Essentially, it’s about taking a critical eye to look at the value each platform provides for your unique situation. So what’s the better choice for your store if you have a more marketing and growth-focused approach? The following comparison between Shopify and BigCommerce will help you make an informed decision. But first, let’s take a quick look at both platforms. Shopify was founded in 2006 and is a leading e-commerce platform that powers more than 250K e-commerce stores and websites all over the world. Shopify has 9.17% market share. It is popular for its ease-of-use that enables anyone to create and run an e-commerce store without any coding skills and a great range of easy-to-use templates. BigCommerce was founded in 2009 and is headquartered in Texas. 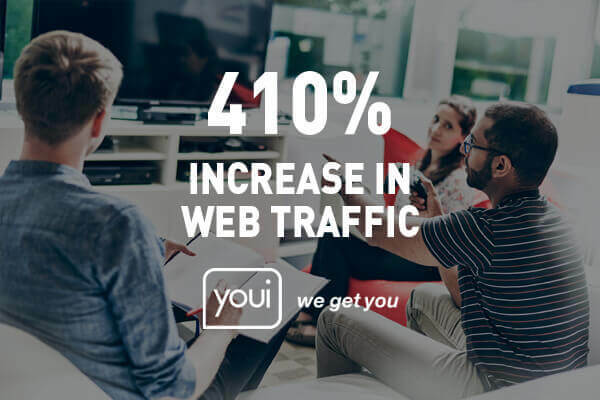 It has 1.46% market share and hosts well over 40K websites. BigCommerce is more of an advanced platform that is mainly used by large online stores. It provides several advanced product settings and features that you’ll not find with Shopify. Let’s take a more critical look to determine which choice may be better for your online store’s marketing and overall growth. Design, your store’s layout, navigation, and user experience are critical factors that define how well or poorly your store will perform in terms of marketing, including SEO. We all know how strict Google is about user experience when it comes to SERPs. Both Shopify and BigCommerce understand the importance of good design and great user experience. 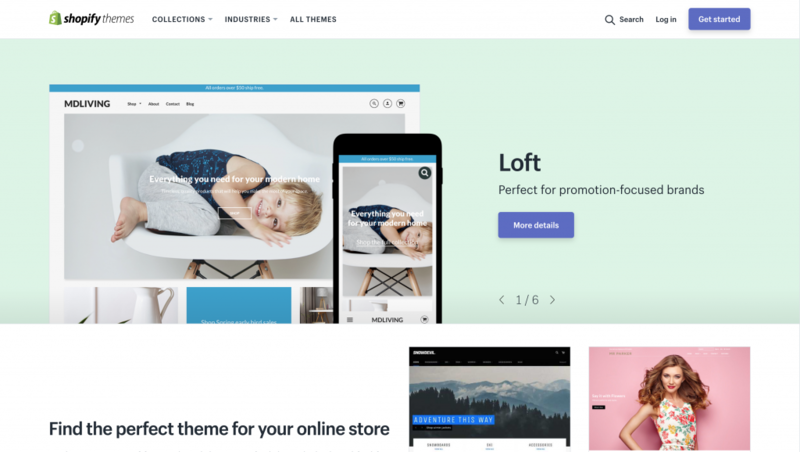 You’ll find tons of free and paid themes with Shopify. Creating a responsive store and then managing the theme isn’t a big deal. Shopify offers a huge library of free, beautifully designed themes. Paid themes come in at around $100 – $180 but are a one-off cost. Shopify has 170+ themes available. BigCommerce is different in that they offer very limited themes of which many have a much older look and feel. They have added a small range of newer themes as of February 2018, but still need to come up to the level and volume of Shopify themes as they have only 80+ themes available. Tweaking a theme is somewhat more complicated with BigCommerce. As an eCommerce store owner, most of your time will be spent dealing with managing products and managing your store. 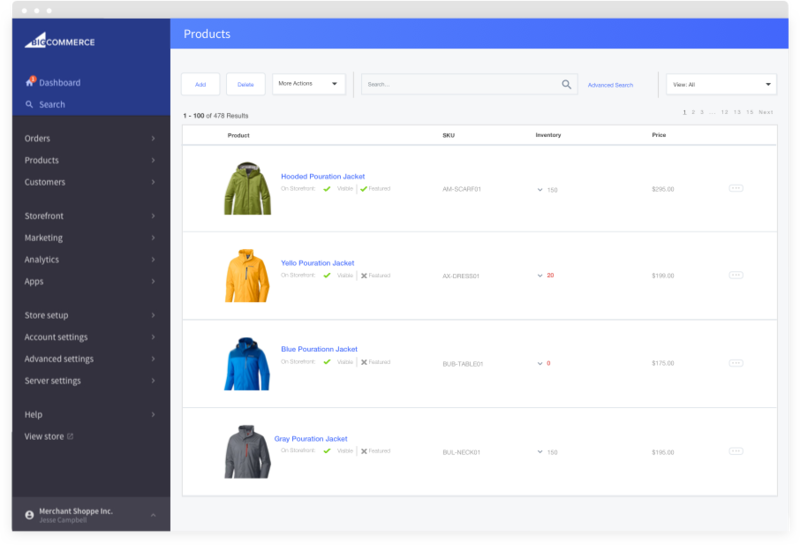 Backend and user interface has to be user-friendly so you can easily customize your products and store the way you want. Shopify is great with straight-forward customization and usability. Anyone can upload products without much guidance. Adding, categorizing, and modifying products is dead simple. You can add product descriptions, images, product cost, etc. without a hurdle. There are also many tutorial videos produced by Shopify and its users to help guide you along the way. BigCommerce is also relatively user-friendly and intuitive but takes more time to get to know your way around. It provides you with all the features and customization options to add and manage products out of the box. For someone who is new to e-commerce, BigCommerce is a bit more complicated compared to Shopify. This is mainly because BigCommerce offers you a lot of advanced features that help you customize your store but these may be harder to understand their applications for novice users. Fortunately, both Shopify and BigCommerce offer very good support. Both have 24/7 capabilities via email, chat or phone. Both BigCommerce and Shopify have a team of “Experts” on hand to help you with queries, however, Shopify has a much larger team available at over 780 qualified “Experts” you can engage to help you with anything you need. Keep in mind that hiring “Experts” does carry an associated cost. Overall in this category, Shopify wins for being the most user-friendly with the strongest support network making it an excellent choice for first-timers. If you prefer high customization over ease-of-use, go with BigCommerce but be aware you may need more speciality help as you go along. You need several e-commerce tools to successfully run, promote, grow, and scale your store. Both eCommerce platforms provide several essential tools to help you learn as you go and supercharge your store’s performance. Shopify comes with all the basic eCommerce tools needed to run your store. For instance, Shopify Payments is one of their most popular features that lets you manage payments right from your dashboard. However, if you need advanced tools such as product recommendations, wish lists, etc. you have to purchase them in the app store at an additional cost. Shopify offers over 1400+ paid apps for numerous operations. Both platforms can surprise users with the “hidden” costs of the apps you might want to use to further customise the way your store works, and with monthly subscriptions, these can quickly add up. BigCommerce offers you a complete set of basic apps out of the box as well as offering more advanced tools in the paid apps section. You’ll get access to all the apps for free with BigCommerce that you have to buy at Shopify such as product reviews and recommendations which is a plus, however when you venture into the paid app territory you have a more limited choice with BigCommerce offering only 250+ apps. So how much you have to pay a month to run your store on these eCommerce platforms? Both Shopify and BigCommerce offer three main plans to choose from. The basic plan at Shopify is priced at $29 a month, the standard Shopify plan is priced at $79, and the Advanced plan comes at $299 a month. Shopify Plus is their enterprise level customized plan for large merchants. 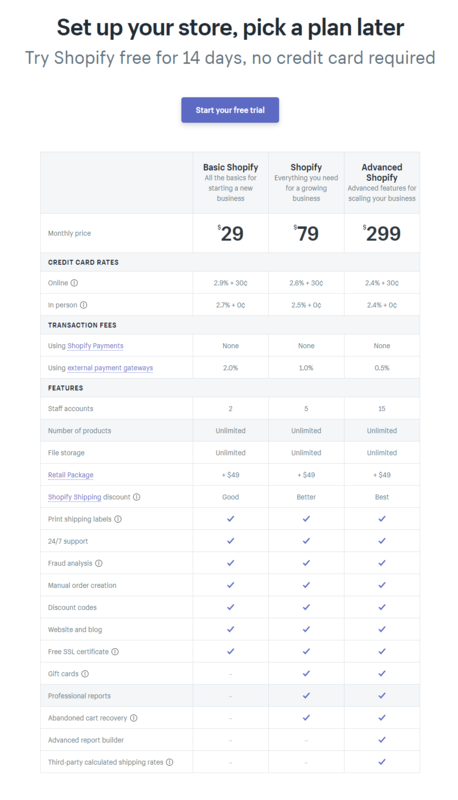 Shopify charges a transaction fee that ranges from 0.5% to 2% per transaction. You’re also charged with credit fee that ranges from 2.4% to 2.9% + 30 cents per transaction. This transaction fee model is how Shopify supports the resources required to run your store. So as you scale, the transaction fees keep pace. BigCommerce works on a different revenue-based model, but don’t be fooled into thinking that just because they don’t charge a transaction fee, it’s the easy option for growth. Keep in mind you’ll also have to buy certain apps from the Shopify store just to get started. As discussed above, Shopify has a limited offering of free apps and tools. BigCommerce also offers you with three core plans: Standard ($29.95/mo), Plus ($79.95/mo), and Pro ($249.95/mo). An enterprise plan with custom pricing is available for large merchants. BigCommerce doesn’t charge any transaction fees whatsoever. You get every single penny that you earn. However, you have to upgrade your plan if you make a certain sales number in a year. Every plan has a sales per year threshold. For instance, if you make $50K in sales for the Standard plan, you have to switch to Plus. There are no hidden costs with BigCommerce as you get all the basic and advanced tools to get started for free. You’ll rarely have to invest in a tool in early days. However, do keep in mind that if you are building a business you really want to grow and scale, this becomes a more complex and costly exercise. While you should never make a decision this important based on monthly subscription prices alone, we feel that BigCommerce’s pricing model is more transparent. It’s important to weigh up the real value of the platform to you, including the opportunity cost of the time it takes to DIY elements on each platform and how easy or complex that may be. The BiGCommerce pricing model is based on yearly revenue instead of charging transaction fees, so be aware that as your revenue grows, so too will your subscription fees. 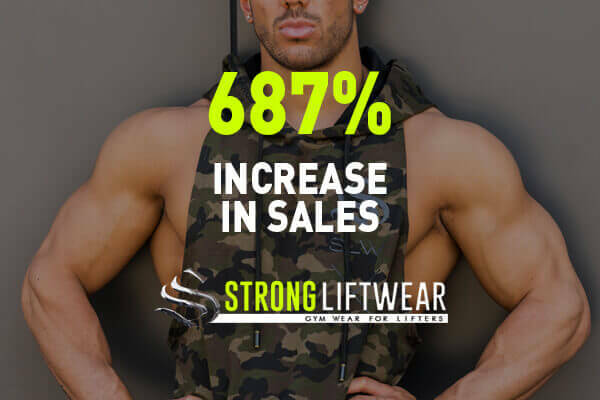 Both eCommerce platforms have easily integrated marketing, providing lots of marketing apps that help you promote your store in any way you like. 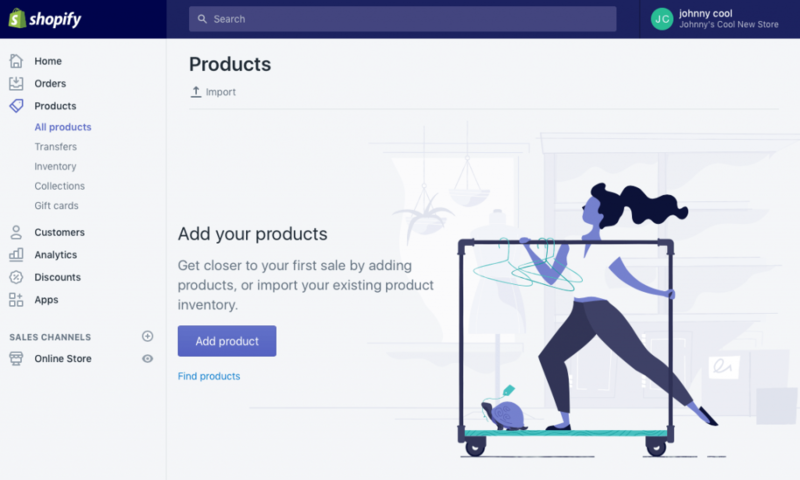 As BigCommerce provides you with stronger customization options, allowing for a unique store design, BigCommerce takes a lead. When your store grows over the years, both platforms deal with scalability effectively. You can upgrade your plan with both the platforms as your business grows. There are lots of tools and apps that work for businesses of all sizes. It’s important to note that depending on where your store is based, each platform has different country/region options and limitations. This can be as important as language options through to site integrations. The most effective way to trial this is to take advantage of the free trial period offered by each platform to determine if it will meet your region’s needs. BigCommerce tools collection is one thing that helps with scaling a lot. Its better customization features, pricing strategy, and advanced cutting edge eCommerce tools make it a better options for large eCommerce merchants. Both these platforms have their own unique features and aspects which can really only be evaluated for your individual circumstances, by taking up the free trial offer with each platform and making your own comparison. If you’re relatively new to eCommerce and like things to be elegant, simple and not have to do too much speciality customisation, Shopify is our pick. BigCommerce is suited to slightly more advanced users or those who are prepared to invest more time and money into customisations. Ultimately the best approach is to try the risk-free trial offered by both platforms and work through your check-list of must-haves before making a decision.